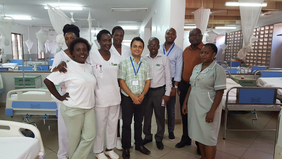 Kupona’s partner, CCBRT, is the largest provider of obstetric fistula care in Tanzania. Learn about HR needs from the hospital’s two FIGO-accredited fistula surgeons. 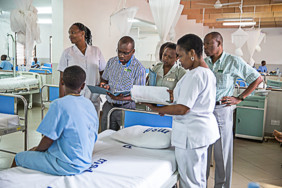 CCBRT: How would you describe the HR needs around fistula in Tanzania? Dr. James Chapa: The needs are great. 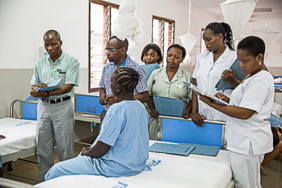 Of course, we need more fistula surgeons – there are only around sixteen trained in Tanzania. And of those sixteen, only around five or six are practicing. But surgeons are just one part of the shortage. Fistula patients require a dedicated team for holistic recovery, including specialized nurses, physiotherapists and psychologists. Remember, fistula is more than a physical condition. Women with fistula have often experienced serious trauma and years of social exclusion as a result of their condition. Dr. Peter Majinge: It’s true. You can have the best surgeon in the world, but you also need a skilled pre-operative, intra-operative and post-operative team to do the job well. CCBRT: How are we working to fill the gaps? Dr. James: In 2014, CCBRT received official accreditation from the International Federation of Gynecology and Obstetrics (FIGO) to become an international training center for fistula surgeons. Since then, we’ve trained 18 new surgeons, but few from Tanzania. We need to train more local care providers. Dr. Peter: We’re also coordinating a stakeholder network across Tanzania, developing standardized guidelines and advocating at local and national government levels for prioritization, ownership and greater resourcing around fistula. All of these activities help strengthen the workforce. CCBRT: Ultimately, the best solution for ending fistula is preventing it, through high-quality maternal healthcare. In conjunction with these efforts, labor ward staff should be trained in recognizing and referring fistula as soon as it develops; community-based health personnel must also gain knowledge of its causes and symptoms. What are your big dreams for solving the HR shortage? Dr. James: There is a big need for HR around fistula because fistula is a big problem: 3,000 new cases each year in Tanzania. And no region of the country is spared – it’s everywhere. I’d like to see at least one fistula surgeon and two fistula nurses trained and placed in every regional hospital. And these professionals should be recruited from their own regions: let’s train physicians from Lindi to work in Lindi, so they’ll be more likely to stay and help people from their community. Filling these gaps will bring us a long way toward ensuring that every woman with fistula has access to high-quality treatment.